Blade construction: Shinogi-zukuri, Iori-mune, Mihaba is moderate standing firmly with a bit on deeper side curvature and upper Fukura area is swelling out leading to to an elongated Kissaki. The entire shape is proportionally designed for drawn fast in one hand. Forging(Hada): Forging is conspicuous Itame mixing with large Mokume-hada indication. Fine steel gives off moistened impression by sparkling Ji-nie glitter that generates rich and thick Nie lines of grain pattern so called CHIKEI activity. Temper (Hamon): Hamon is based on fine Nie sparkling hard metal granules that accumulates deeply on boundary line, starts with straight Yakidashi, undulating Notare that combined with small Gunome outline. The interior of temper is filled with mist-like crystallize area deeply with abundant short ASHI activities. Temper of tip (Boshi): Temper of Boshi forms straight medium circle turns back deeply. Tang(Nakago): Nakago remains entirely original in UBU holding good taste of patina. One Mekugi-ana hole. 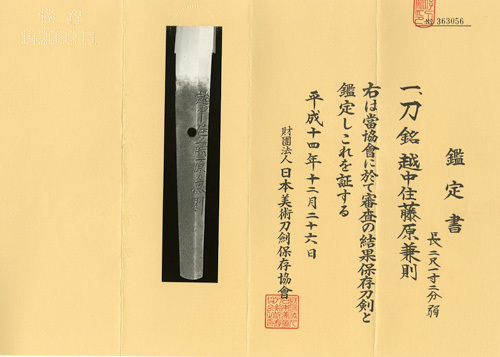 Slightly slanting left Sujikai filemarks. Double bevelled Kurijiri heel. The signature in Hakiomote side is seven character that starts from the place of work E'chu-ju 越中住 and the name of clan Fujiwara 藤原 then smith name KANENORI 兼則. KANENORI 兼則 whose founder is Naoe-shizu 直江志津 school in Nanboucho period had played major role of San-ami school 三阿弥派. Some of them had moved their workshop to Echizen, E'chu, Owari or Shinshu domain like the other makers in Seki started to live in major castle towns during end Muromachi early Edo period. KANENORI 兼則 made the great rumor being spread as supreme sharp cutting performance to meet with increasing demands from brave Samurai. 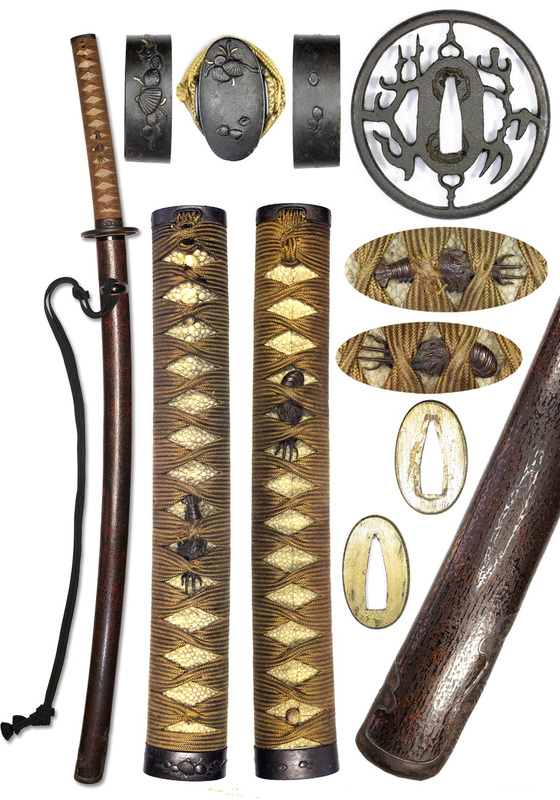 Tsuba : Shikunshi design the four nobles/seasons representing the orchid, chrysanthemum, bamboo and plum in Japanese art, Iron ground, openwork, unsigned Tsuka : White rayskin, golden brown silk cord lozenge wrap (some fray appears due to age) Gold foiled double layers Habaki collar, preserved in Shirasaya plain wood mounting Good old polish/Condition scale: excellent - very good (using a scale of mint-excellent-very good-good-fair-poor).